The last year has produced a wave of portable, sometimes palm-sized multitrack recorders. Boss calls its new BR-800 "a battery-powered studio to go." The sleek new design is made possible by touch-sensor switches and SD-card recording media. Up to four tracks can be recorded or eight tracks played back simultaneously, plus an additional stereo track dedicated to the built-in rhythm generator. The BR-800 effects are derived from Boss’ flagship processors, including vocal effects from the VE-20, COSM® guitar/bass effects from the GT-10 series, and modeled acoustic-guitar body effects from the AP-1 preamp, which imparts pro-quality miked-up sound and rich body tone to line-recorded acoustic guitar. You’ll be amazed at how much processing power is built into this little recorder, and how excellent the effects sound. You can power the BR-800 from the included AC adapter, or for ultimate mobility, it can be powered from six AA batteries. Record anywhere! The BR-800’s USB compatibility enables a variety of functionality with computers. 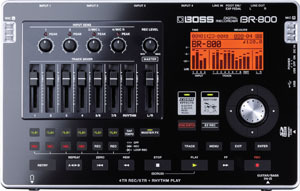 Connected to a PC, the BR-800 will function as an USB audio interface for recordings that utilize the internal effects. The BR-800 can also function as a control surface for DAW software. The BR-800 is expected to be available in May with an MSRP of $525. For more information, visit www.RolandConnect.com.